There are some Mondays that a Pastor wants to hide under a rock or, if he can find one, a rock under a rock. Today is not one of those Mondays. I have been getting reports from many people on how the Word of God is challenging them to examine their relationship with the Lord. * The Lord would not allow me to sleep on Saturday. I was up examining my relationship with Him and my service as under-shepherd of Bethany. * I had to cancel my Sunday School class due to my having to re-write almost half my sermon. * The Kid's Christmas Play was amazing! * It was a little strange preaching without a pulpit, but then again I did have a music stand in front of me. 1. It was very warm up on that stage. 2. I don't know if anyone else noticed but I was very, very nervous. * Our music team did an amazing job as usual! * Wow! Six baptisms. All kids! * I am so excited about what God is doing. It is a bestseller, which means that it has been read by many, many people. Dr. Dyer is a traveling lecturer which tells me that he is, at least, moderately influential. It seems to me that all eastern religions / faith systems do not see what is known as THE CREATOR - CREATURE DISTINCTION. This is a basic tenant of Biblical Christianity, and Judaism for what it’s worth. It simply states that God is not, in any way, shape, or form, part of His creation. Theologically, I have several problems with this book. It is built on the faulty premise that one can “reconnect to intention” (intention is synonymous with God in this book) on his or her own terms. This is in clear opposition to the words of Jesus in John 14:6 where He unashamedly declares: I (Jesus) am the way the truth and the life and no man can come unto the Father but by (through) me. Dr. Dyer handpicks several teachings from a variety of “spiritual teachers” with a heavy emphasis on the metaphysical. Readers, I have no choice but to give this book two thumbs way down. 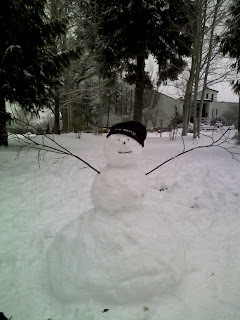 Two days ago the three oldest children and I made a snowman. The children have named him Jimmy. "Why? ", I asked my oldest with a somewhat curious smile. "Because daddy... that's his name." Today was a lot like the others… only more funner. I know, I know. Funner is not a real word. But I have to admit that I really had fun today. I was actually able to wakeup this morning at 7 am after going to bed around 2 am. Yep… that’s a whopping 5 hours of beauty sleep. The Elders met with a missionary couple. We had a sweet and productive time of fellowship. I was able to hear a ten year old boy’s testimony. A dear brother and I went out and made several visits. While he and I were out and about, we dined at a local restaurant where a couple from the church was also dining. So we ate together. The server that Bethany is back up and running which means I got the hundred or so emails that had been accumulating. Jesus Christ is coming back! As much fun as I have spending time with my family and in ministry and studying the Word, I am looking forward to the time when the Word made flesh makes His second debut. I had a great day today and I hope to have another just like it tomorrow. Even so Lord Jesus come. 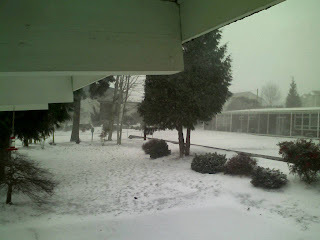 Due to Portland, OR being snowed in, Bethany Baptist Church had to cancel services for this morning. Here is this morning's message... from the basement of our house. It is my prayer that the Lord ministers truth to your heart and challenges you to serve Him. And yes... I am preaching in shorts. Services for tomorrow are cancelled. Enjoy your family and check in often. I will be posting a Special Christmas Message tomorrow. Which do you prefer: keeping your house cooler during the winter and wearing blankets to save money, or paying the extra cash for a better quality of life? Now let’s take this into the realm of the spiritual. When all is said and done, every believer in Jesus Christ will stand before the Judgment (Bema) seat of Christ. Are we willing to pay a little extra in terms of service and submission to the Lord now with the promise of great wealth on that Day, or are you content with having a “better quality of life” now, free of persecution and the ridicule of being known as a believer in Jesus Christ, with little to show on that Day? May the Lord lead us in the way the pleases Him and may we be wise enough to follow. Wow! From the mouth of an atheist. May the Lord give us the compassion and passion for the lost. Don't let the affairs of the day keep you from being a good steward of your time and talent. This is the opening line and title of a classic Christmas song written in 1951 by Meredith Willson. The rest of the song has nothing to do with Jesus, but it brings the point home: IT SURE LOOKS FESTIVE OUT THERE. A change in perspective leads to a change in direction. While it is true that many, many people were not able to make it out to Bethany, we had a great time of fellowship, singing, and study. 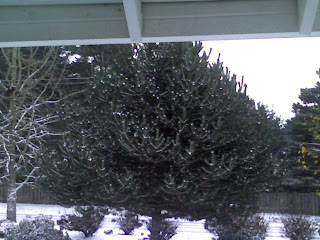 - My kids saw and played in snow for the first time. - We were small in number, but GIANT in ministry! - I felt a great deal of freedom preaching yesterday. * Be Encouraged, knowing He is faithful and promised to come back for His church. * Be Challenged to live a godly life. * Be Ready, for the Lord can come at any moment. Here is last week's sermon run through video. It's Beginning to Look a Lot Like Christmas.... everywhere I go. When I woke up this morning, there was no snow. When I looked out the window at 8 o'clock this morning, there was no snow. When I made the long trek across the parking lot at 8:30 this morning, this is what I saw. 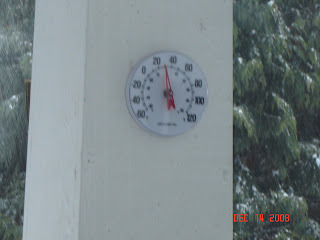 Here is the thermometer on our front porch. When we got home, I finally got a glimpse of why people decorate plastic trees! This is the view from the Kitchen after lunch. It was ripe for mischief. 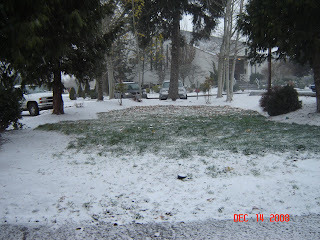 So... when we got home... there was a snowball fight. Submit to God (James 4:7, NKJV) -- We need to be totally devoted to Christ and have His Word in our hearts and do His work as His hands. Resist the devil and he will flee from you. (James 4:7, NKJV) -- Satan is no match for the power of the Spirit that indwells every believer. Don't let him steal your joy! Do not speak evil of one another, brethren. (James 4:11, NKJV) -- What a powerful statement James makes. We aught to seek to build each other up and not destroy on another. ﻿To him who knows to do good and does not do it, to him it is sin. (James 4:17, NKJV) -- There you have it folks... the sins of commission and omission combined. Blessings to you as you seek to do the Lord's will. Wouln't you know it... the video is TOO large to post. Wow! What did the Law mean to the Lord from eternity past?... to the Israelites when it was issued? To you and me in the 21st century? We saw that the Law’s main purpose is to show us our need to be the abiding branch Christ refers to in John 15:1 - 5 . Next week we will be looking at some of the prophecies concerning the second coming of Christ. Today we are looking at some of the prophecies concerning His first coming. It is useful to know that scoffers deny most of them. · that we may be “thoroughly equipped” PASSIVE TENSE!!! THE WORD IS WHAT CHANGES US…. We deepen our trust in the Lord as we see how faithfully He delivers what He promises. Today we are going to see that God was proactive in seeking a relationship with fallen, sinful people. HE LOVES US AND PASSIONATELY SEEKS AFTER US. Have you ever been woken up in the middle of the night by a child or a loud sound and you don’t know what to do because you are half asleep? THAT IS NOT WHAT PROPFECY IS LIKE. Have you ever listened to a one year old talk to some one for 10 minutes non-stopped and when they are done you had no idea what they said? THAT IS NOT WHAT PROPFECY IS LIKE. Have you ever told someone that you would be at an event at such and such a time only to find that circumstances forced you to cancel at the last minute? THAT IS NOT WHAT PROPFECY IS LIKE. b. Because it can be verified… because it can be proven.... God is proven faithful. 1. Who is being cursed here? Adam? Eve? Serpent? 2. Who’s seed? Adam’s or Eve’s??? 3. Who wins? The Serpent’s seed or Eve’s? Does Genesis 3:15 PROVE the Virgin Birth? NO! Isaiah 7:14 It is narrowed. Therefore the Lord himself will give you ﻿(Hebrew here is PLURAL) ﻿ a sign: The virgin will be with child and will give birth to a son, and﻿ will call him Immanuel. The word used here is “alma” and it occurs 7 times in the O.T. 1. Every usage of this word in the OT is referring to a virgin (un-married woman, Deut makes mention of this as does Matt 1:18-19), regardless of it’s “technical” meaning…. Words are defined by their usage… you drive in a parkway and park in a driveway. HIS NAME AND JOB DISCRIPTION WAS PROPHECIED!!!! Remember the 3rd commandment? Your name is a representation of your reputation. This time He sent His Son. For to us a child is born, to us a son is given, and the government will be on his shoulders. And he will be called Wonderful Counselor,﻿ Mighty God, Everlasting Father, Prince of Peace. whose origins﻿ are from of old, from ancient times. WE, IN THE 21st CENTURY CAN TRUST THAT GOD WILL DO, WHAT HE SAYS HE WILL DO. Might I submit to you that just as John was the one who was commissioned before he was born to be the one to declare the coming of the Lord, believers today are the ones who have been commissioned before we were born (Ephesians 1 and elsewhere) to be salt and light… preparing the way (witnessing with word and deed) for His second coming. Spiritual growth for the committed. Grace in time of need. Is there anything in your life that you are not trust Him with? WHY? 3. Jesus Christ stepped out of glory, out of heaven to save the church. He humbled Himself and became a servant. Will we step out in faith and serve the world around us? taking the very nature﻿ of a servant, being made in human likeness. 4. God loved us and He demonstrated that by giving. How are we showing the world that we love them? How are you? 5. The Gospel: How much more practical can I make it. I am your pastor and I love you. And this is the hard truth, Christmas time is a time when the world looks at the babe in a manger, BUT FROM ETERNITY PAST UNTIL ETERNITY FUTURE THE FOCAL POINT WILL BE THE CROSS. · Today, it is at the cross that we find salvation. · Today, it is at the cross that we find hope. · Today, it is at the cross that we find strength. · Today, it is at the cross that we find Jesus. If you are here today and you need hope, strength, or salvation… you need Jesus. By now both people who follow this blog know that we are experiencing some massive server problems at the church. I have been email-less since last Friday. Yesterday I walked in to the office and found the ladies with a paper calendar and pencils. Just one week prior all they had to do was shoot off an email. Here are a few things to take away from this whole experience. God is still n the throne, even when things are maddening for us. God is still saving people, internet or not. The first century church did not rely on the knowledge and efficiency of their network server. They relied on the power of God. The Gospel of Jesus Christ made it all the way to Portland, OR without the help of the internet. My son and I went to the store yesterday. He is only two and can’t unlatch himself from the car seat… I had to do that for him. 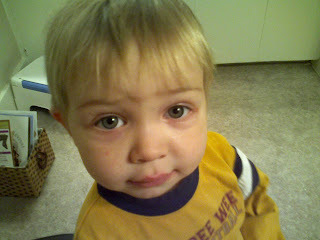 He took my index finger in his little hand as we walked across the parking lot. He saw a truck coming our way, not that big… only a Ford Ranger… but big enough to scare him. I know because he squeezed my hand and looked up at me. While you may not understand everything He says, He understands your every word. Much like my son would have been in grave danger in the parking lot by himself, you and I need to cling to the Father’s hand… knowing that He will lead us to safety. Just as the Ford pick-up truck did not faze me but terrified my son, the circumstances of our lives do not frighten the Father. We should cling to Him for dear life. 2. The Lord is still saving people. 3. It was nice singing some of the old(er) Christmas songs from years gone by. 4. I had a fantastic time preaching on a few prophecies concerning Jesus’ First Advent. Fantastic! God is so good to us!!! Proverbs never defines wisdom, it just shows examples. What does wisdom look like? Knowing that a tomato is a fruit is knowledge. Not putting it in a fruit salad is wisdom. 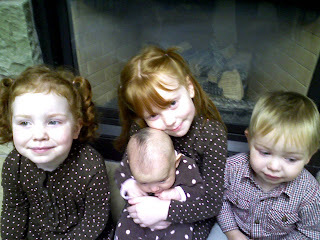 This is a picture of the four Johnson kids. This photo was taken a couple of weeks ago in the basement (fireside room) of Bethany Baptist Church. As some of you may know I live in two spheres of existence. One sphere is here, in the nether regions of cyberspace and the other is in Suburban Portland, OR… also known as “reality”. Well, at the suggestion of another local Pastor, I have decided to join twitter. Think of it as social networking in the nether regions of cyberspace. I have put a live update (ok… there’s a three minute delay) on this web page so you can get the idea of it. Really nifty stuff. 1. The Lord is doing some great things at Bethany and in other Portland churches. 2. We have some ultra creative and innovative folks at this church. 3. We have some strong leaders in leadership positions here. I have managed to schedule 12 meetings this week. MOST OF THEM ARE OUT OF THE OFFICE(S). I am so glad that God is not so booked that He has to “check His schedule” to “pencil in a time” for me. And I’m thankful that the same goes for you too! I record myself running through my sermons on Saturday nights. I do this so I can work-out all the "kinks". I arrived a little late (8:30) and when I got there I found that the A/V guys were hard at work, the musicians were hard at work and Leslie was working hard at getting all the coffee brewed. If only people knew what goes on behind the scenes. My Sunday school class is small, but intimate. We had some great discussion and I am looking forward to teaching through the Doctrine of Dispensationalism in the coming weeks. I am told that the Thanksgiving weekend is one of the least attended weekends for churches; so I was expecting far fewer members than were present. Praise the Lord that He does not follow “statistics”. What can I say about the worship music? I am always blown away by the talent and quality of the work every singer and musician brings to the service. I am also elated that they view themselves as worshipers and not performers. The Rulis baby dedication was such a blessing and my wife is now urging me to consider doing the same. She told me that she has been thinking about it for a while but did not know how to bring up the subject. Funny. I felt somewhat the same. How do I handle this Law? How, O Lord, do I present this crucial piece to Israel’s history to your church? From what I heard both first and second hand, the Lord saw fit to bless the teaching of His Word. Today ended the Sermon Series in the Book of the Exodus. Next week we will look at Prophecies concerning Christ’s 1st Coming. I am always encouraged when I see so many people engaging one another in conversation after the services. I love watching fellowships deepen and new ones begin. Well… that just about does it. I am sure there is something I missed… sorry.